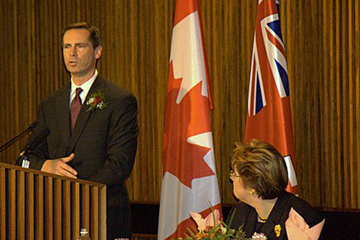 The Honourable Dalton McGuinty, Premier of Ontario, was the Guest of Honour. 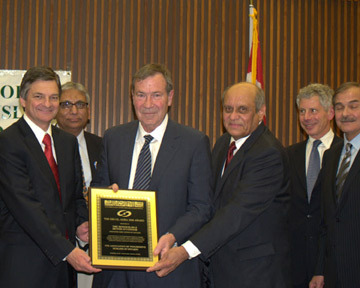 The citation was done by Honourable Roy McMurtry, Chief Justice of Ontario. CLICK HERE for photos and story. Honourable Senator Vivienne Poy who is also the Chancellor of the University of Toronto, was the keynote speaker and award recipient at these celebrations. 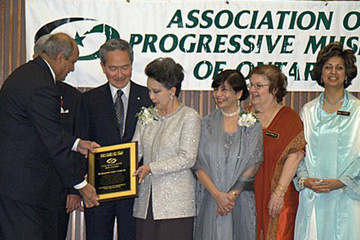 The Association paid tribute to her for her "OUTSTANDING COMMUNITY SERVICE AND ACHIEVEMENTS AS A BUSINESS WOMAN, SENATOR AND CHANCELLOR OF THE UNIVERSITY OF TORONTO, YOUR WORK AS AN ADVOCATE FOR VISIBLE MINORITIES AND IMMIGRANT COMMUNITIES, AND FOR PROMOTING GREATER UNDERSTANDING OF ASIAN CANADIAN CONTRIBUTIONS ACROSS CANADA DURING ASIAN HERITAGE MONTH IN MAY”. Senator Poy was presented with a plaque and Keith Sanduluk's polar bear sculpture . 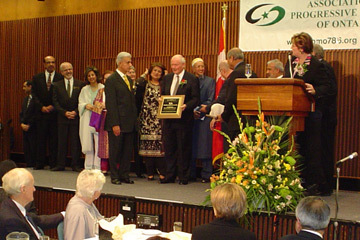 THE PROVINCE & PEOPLE OF ONTARIO WERE HONOURED AT THE EID-UL-FITR CELEBRATIONS ON NOVEMBER 17, 2006 "TO RECOGNIZE THE PROVINCE FOR MAKING ONTARIO THE MOST DIVERSE, MULTICULTURAL AND TOLERANT SOCIETY, WELCOMING THOUSANDS OF PEOPLE EVERY YEAR FROM ALL CORNERS OF THE WORLD, TO COME HERE AND LIVE IN PEACE AND HARMONY". Dr. Mahmoud El-Saeed, Ambassador of Egypt, was the Keynote Speaker and Award Recipient. 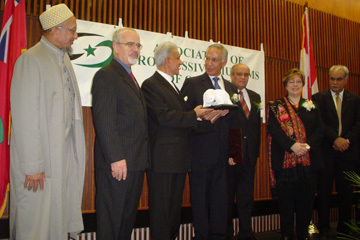 He was honoured for his "distinguished diplomatic career and outstanding contributions in making Islam and Muslims better understood by Canadians". 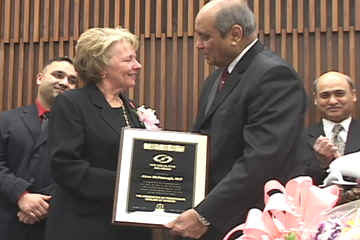 Dr. Al-Saeed was presented with a plaque and Sandulak's polar bear sculpture titled "Northern Titan". For story and photos, click here. "In recognition of your distinguished career as a Leading Counsel, and Eminent Academic, Jurist, Commissioner of Public Inquiries, serving the people of the Province of Ontario and Canada with Wisdom, Compassion, Fairness and Courage."